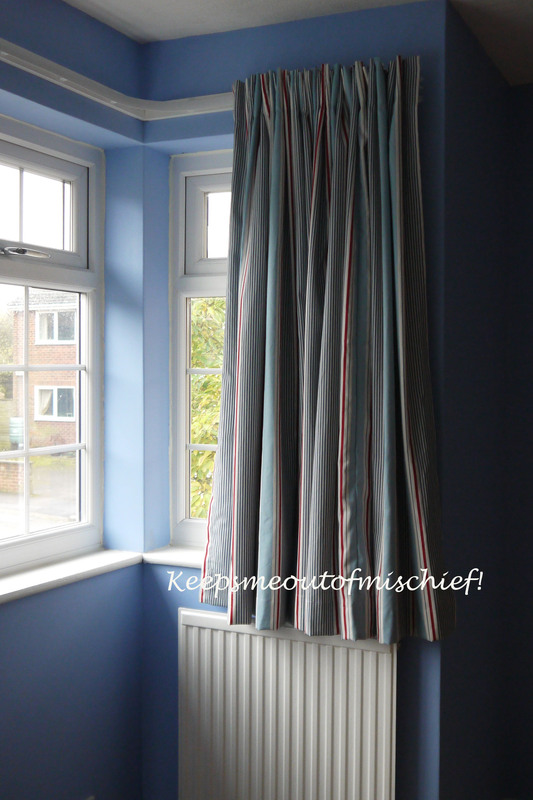 Curtains for a Big Boy’s Bedroom | Keeps Me Out Of Mischief! With a room that we’d never decorated since we moved into the house almost two years ago, it was time to rip up a slightly dodgy looking beige carpet and get rid of some curtains that should have stayed in the 1990s! This is the bit I love about decorating, the massive change you can make with just a bit of paint and some new fabrics. The room now feels like it belongs to us and not someone who lived in the house 20 odd years ago. I’d already decided to keep the walls plain so that we wouldn’t have to decorate again too soon. We had thought about going with a proper ‘little boy’ theme with Thomas the Tank Engine wallpaper, but I was worried that he’d grow out of it too quickly. So blue walls appeared and I decided that we had to go with a similar plan for the curtains. The windows in this room are massive (410cm wide) and require a lot of fabric to cover them properly. I started scanning the internet and pinning my favourites. A definite theme emerged and we decided to go with stripes. 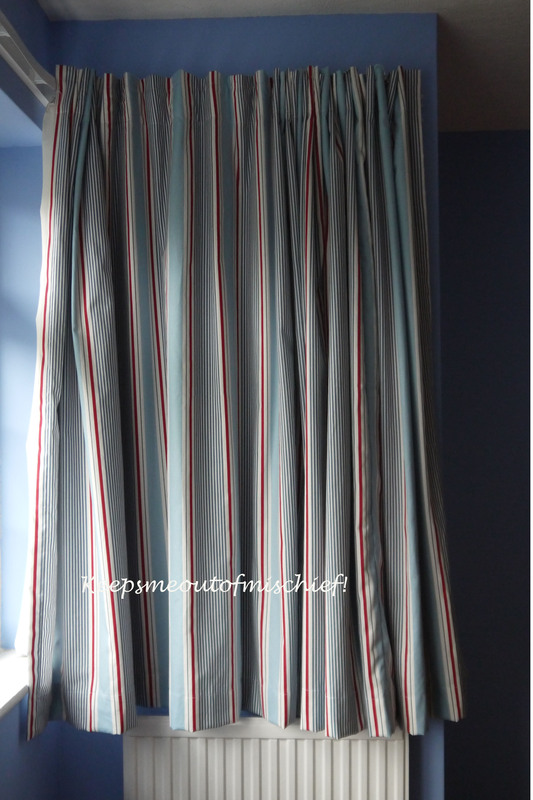 I’d found this fabric on the internet, but at £24 a metre I was a bit worried by how much it was going to cost to complete these massive curtains. Then I remembered a fabric shop that I’d used in the past to make some curtains for my previous house. I visited Low Woods Furnishings near Shepshed and was lucky enough to find the exact material I’d been looking at but at a drastically reduced price of £10 a metre. This now became a viable way forward so we bought 10 metres as I wanted to be sure I could make curtains that were full enough, but I also wanted some left over to make soft furnishings for the rest of the room (more of this to follow in future posts). Unfortunately my sewing machine has been misbehaving a fair bit recently and, having spent so much on the fabric, I wanted a reliable machine so in stepped my mother-in-law who came around for the day and we completed the job while Granny entertained the sprog. Great job. Amazing how new curtains and a coat of paint can spruce up a room. I always opt for plain walls in my kids’ rooms too. My goal is to repaint as seldom as possible!